An effective workplace culture and working environment are more important than ever for today’s leading companies. Companies are using the workplace itself to inspire innovation, save money, and attract and retain employees. Unwired Ventures, organizers of WORKTECH11 West Coast, sat down for a chat with Jeremy Neuner, CEO of NextSpace; Kevin Kelly, Senior Architect, Public Buildings Service Center for Workplace Delivery, U.S. General Services Administration; and Collin Burry, Principal, Gensler. Jeremy Neuner: 2012 will see an acceleration of the disaggregated workforce as large companies attempt to decrease real estate overhead and increase the productivity, innovation, and happiness of their employees. Simultaneously, we’ll see a rise in the spaces, tools, and technologies needed to effectively and efficiently re-aggregate the workforce around common interests, common purposes, and common communities. Kevin Kelly: Especially with the recent economic and political drama, governmental entities which would never have considered a major move to mobility are now seriously exploring it to save on real estate and to reach mandated environmental goals. Luckily, because there has also been a huge growth in the field of workplace strategy — a new discipline if you will — and because of the ubiquity of mobile technology, this can be a much more sensible “space diet” for the U.S. Government than the poorly thought-out one executed in the 1980’s. Because the government is such a huge pool of knowledge workers, this is bound to affect the workplace industry overall. President Obama’s June 2010 call for $3 billion in savings in unused Federal real estate has given this reduction traction and major U.S. agencies are definitely getting the message — working to change a 1980’s culture wedded to “the cubicle” as the only yardstick of workplace quality. While there is a trend toward a cut in the quantity of personal space, there is a counter-vailing realization that people are far more expensive than real estate. When they come to the office, primarily to work with others, they need to have greater variety of settings and an excellent quality of workplace in order to perform optimally. These trends will continue in 2012 and as necessity forces cultural change, the change-over to a new view of the workplace — and of work — will only accelerate. Collin Burry: The user experience, while in the office, is more important than ever. Design as we’ve known it is dead. Even though technology has enabled us to work anytime anywhere, workers want to come to the office, employers encourage it; it is the place that communicates culture and a sense of connection to the company. Distributed offices become more popular, rather than a centralized headquarters in suburban areas. Workers want to work where they live and avoid horrible commutes. Jeremy Neuner: Rather than a single place, the workplace is becoming an ecology of places — the corporate campus, the neighbourhood coffee shop, the downtown coworking space — that collectively provide the infrastructure and the community that people need to be their most creative, most innovative, most productive selves. Companies that can successfully blend infrastructure with community will be the ones that can attract and retain the best talent and get the best results from that talent. Kevin Kelly: Choice and personal control are huge issues. We know that when they are combined with agile technology, they contribute to the effectiveness and satisfaction of workers. 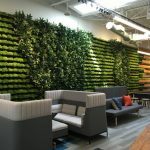 But I am enough of an architect to realize that effective lighting, excellent acoustics, a strategic use of color and branding create the un-ostentatious but professional environment which conveys well-being and a sense of purpose to the workforce — especially the young workforce. I believe they tend to see “throne room offices” hogging the light at the exterior and other quaint entitlements of my baby-boom generation as slightly ridiculous. I believe they feel that the workplace should display greater democracy and common purpose. Savvy leaders are picking up on that and feel the same way. At GSA, for instance, the Administrator (who answers directly to the President of the United States) works in a workstation and the Commissioner of the Public Building’s Service has transformed his huge legacy office from a solitary “throne room” to a “war room” housing his deputies and other decision- makers in close proximity. This kind of “leading by example” is much admired and is starting to be emulated elsewhere in Government. Collin Burry: Today the workplace must be more robust than ever. It needs to be highly responsive to the user’s needs and build a sense of belonging to the company. Ãƒâ€š An experience not replaced by technology. Jeremy Neuner: My favorite place to work is the open, collaborative cafÃƒÆ’ © space at any of our NextSpace locations.Ãƒâ€š It’s impossible not to feel inspired when I’m surrounded by dozens of creative people who are all working on cool stuff: mobile apps, screenplays, software, game design, or the latest super-stealthy, world-changing start-up. Kevin Kelly: I can’t say that I have a favorite place to work. I live in a beautiful part of the world (Sonoma County, California) and have a marvelous garden where I often work on my veranda almost year round. But I love to work in my 1911 office in San Francisco with great colleagues, in coffee shops, on airplanes, even in coastal wildernesses. The fact of the matter is, (dare I say it?) I love to work and do it far more than eight hours a day. Part of that love arises from the freedom I have in doing it. Collin Burry: I love coming to our office. Ãƒâ€š I feel most inspired interacting with other people; the location is not as relevant as being face to face. Jeremy, Kevin, and Collin will be speaking at WORKTECH11 West Coast at the Nokia HQ, Sunnyvale on 11 October 2011. The event is a forum for all those involved in the futures of work and the workplace as well as real estate, technology and innovation. WORKTECH will offer a unique blend of ideas, case studies, workplace innovations and visions of the future. Join senior professionals from real estate, facilities, technology, and executive management, architecture, design and other professional advisors to further knowledge and share expertise. For more information, visit www.westcoast.unwired.eu.com, email isabel.marks@unwired.eu.com, or call 011 44 (0)20 8977 8920.